Bake a cake to celebrate the award! As parks were a matter of public pride their design was as important as that of public buildings, which were built on a grand scale with meticulous attention to detail. Just as a notable architect was employed to design buildings, so equivalent landscape designers and gardeners were employed for the parks. 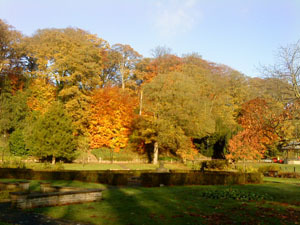 The designer of Congleton Park was Edward Kemp who was helped by the Congleton surveyor William Blackshaw. 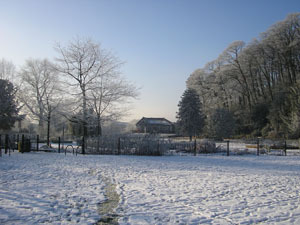 Kemp had worked under the supervision of Joseph Paxton at Chatsworth. 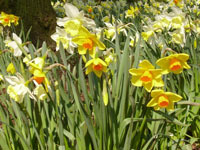 In September 1843 he became Head Gardener and subsequently Superintendant at Birkenhead Park. Later he was consulted on the designs for Central Park in New York! His main aims and many of his ideas were the result of having being trained by Paxton. These ideas included providing open spaces, together with formal bedding and rockeries and a mixture of evergreen trees with the border shapes of native trees. 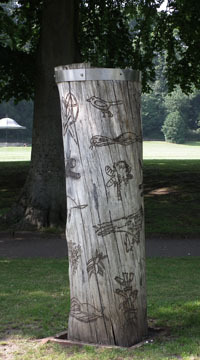 In Congleton Park Paxton's principles are particularly noticeable in the carriageway running round the outside of the park and in its proximity to the river. Paxton always emphasized water features. 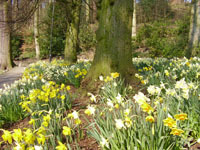 He also encourages the creation of formal gardens and pathways running through them and areas 'for the passive enjoyment of the park's scenery'. 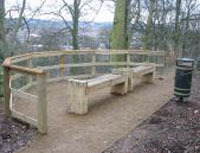 Kemp provided these features as well as seating and viewing points in the park and in the Town Wood. Adhering to Paxton's designs, he also allowed a large amount of open space surrounded by trees. In time other characteristics came to be added - a bowling green and a croquet lawn and provision for boating was made. 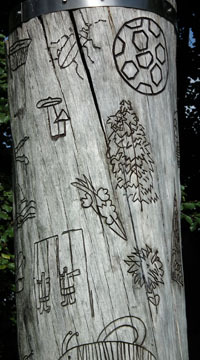 In addition he created a network of winding paths through the wood, many designed to create unexpected twists and views. 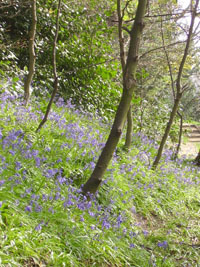 The paths in Town Wood culminated in a high view point, which later became the site for the Russian cannon. 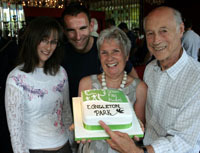 Congleton Park was opened in 1871. 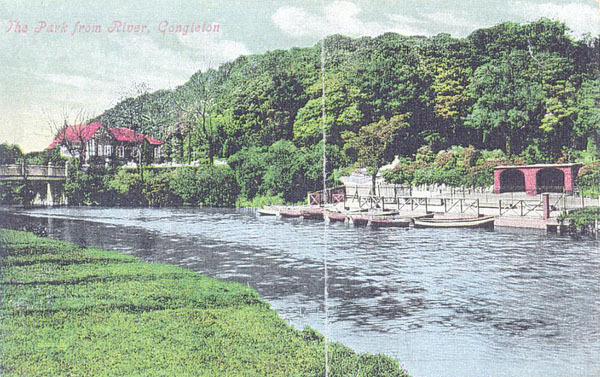 Congleton Park from the River shown on an old postcard; note the absence of trees on the edge of Hankinson's Field. 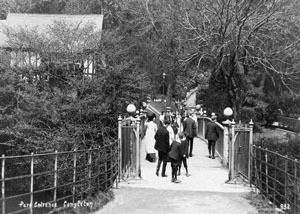 Access to the park was a bridge at the end of Park Road but a second wooden bridge at the end of a path from Willow Street was provided by the end of the nineteenth century. The bridge was accompanied by a fete for its opening. 7000 people are reported to have watched the red, white and blue silk cord being removed to declare the bridge open. The games included a pillow fight on a pole laid across the river, and crossing a greasy pole across the river, pig chase in the park meant chasing a well-soaped pig. 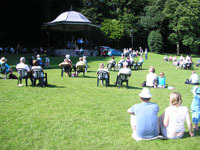 The Congleton excelsior band provided music. This bridge lasted several years before it was replaced in 1976 by the present bridge. 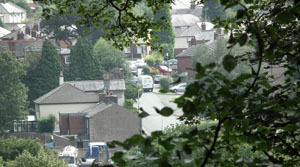 Park bridge seen from Park View, which also overlooks Hankinsons' Field and Congleton Leisure Centre. 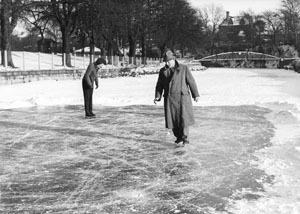 We think the gentleman skating on a frozen River Dane is a Mr Brown with his daughter, and it is during the bad winter of 1962 / 1963 - the river has never frozen over to this extent since! 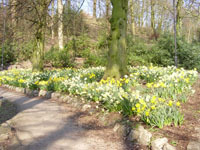 The other picture is of the Park entrance, and has changed little over the years since 1871. This picture was taken circa 1910, and comes from a booklet published by Brampton Publications in 1988, of old postcards compiled by Mary and Colin McClean. 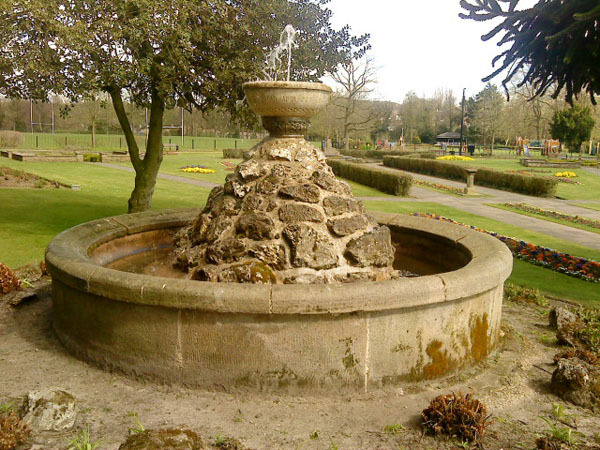 Kemp's preference for a rockery set in formal garden can be seen in the circular fountain added in 1886. 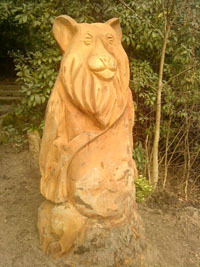 This, made with a base of Biddulph Moor Stone, was placed in the middle of a circular flowerbed. 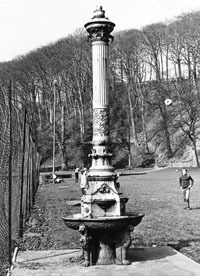 The original drinking fountain was a gift to the town by Mrs. Howard of Brereton Hall in 1887, to commemorate Queen Victoria's Golden Jubilee, and stood at the bottom of Swan Bank. It remained a focus for this part of the town being both a drinking fountain for horses and a lantern. Iron cups were added to it to so that people could also have a drink! 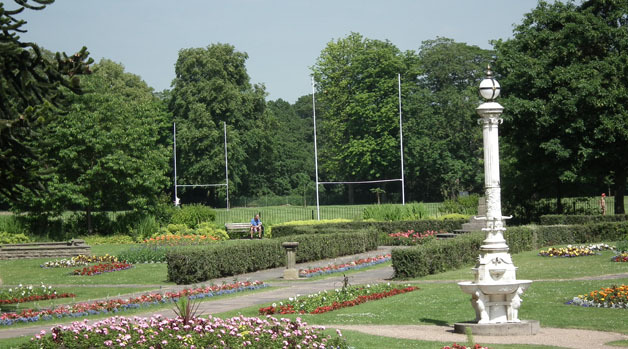 The current drinking fountain, pictured above, used to stand by the old tennis courts, but was restored and moved to Jubilee Gardens. The Crimean war (1845-1856) fought by the British and the French against the Russians, resulted in a large number of cannons being captured, many being taken after the siege of Sevastopol. The War Office, not willing to use these, decided to offer them to towns and cities in England as trophies. The Town Clerk seemingly applied for a cannon in January 1859 and the application was accepted. 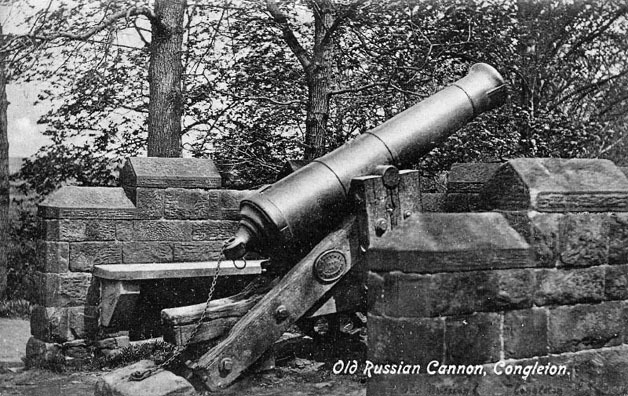 The cannon arrived at Congleton Station on 14 June 1859 and was escorted into the town in an 'immense procession' led by five Crimean War veterans. At first the cannon was placed on a specially built platform situated either at the bottom of Moody Street on an open space now outside the Royal bank of Scotland, or on the other side of the street in front of 'Mr Deakin’s shop', which is where Woolworths was replaced by B & M. By 1871 it seems to have become an anachronism, and the opening of Congleton Park seemed to be a suitable opportunity to move it to a mock fort emplacement at the top of the Park Wood. 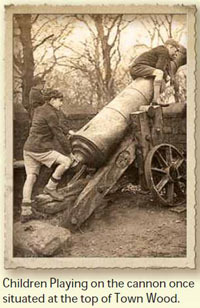 During the Second World War the demand for metal led to a debate by the Town Council for the cannon to be donated to help the war effort. We think this means it was melted down in aid of the war effort. Viewing Point in Town Wood 2013; the view is (with zoom) Brunswick Street. 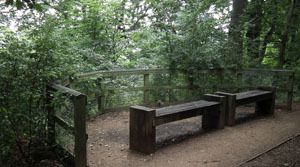 This is the Viewing Point at the top of Town Wood in August 2013. 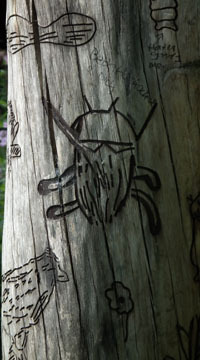 The paths that have been constructed through the wood are marvellous, allowing the ancient Webmaster along with his Wife and two Grand Children aged four and six, to thoroughly enjoy a relatively easy ascent to the top! 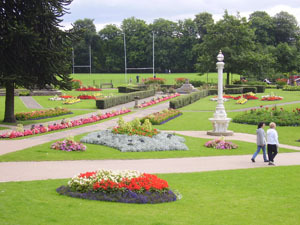 As you can see, compared to the picture on the Congleton Park Facilities page, the foliage has grown considerably since 2007, and the Bowling Green cannot be seen. What can be seen, with the aid of the camera's zoom lens, is Brunswick Street. In 1772 the Market Cross was declared a nuisance and pulled down. The Coronation of Edward VII in 1902 resulted in a revival of civic pride, resulting in the Congleton Chronicle appealing for anyone who knew the whereabouts of pieces to the old cross to bring them to the Town Hall. A number, including two stone blocks at the base of the shaft, were recovered and incorporated into a new structure. This was erected in Lawton Street Gardens on 26th of June 1902 to mark the Coronation. 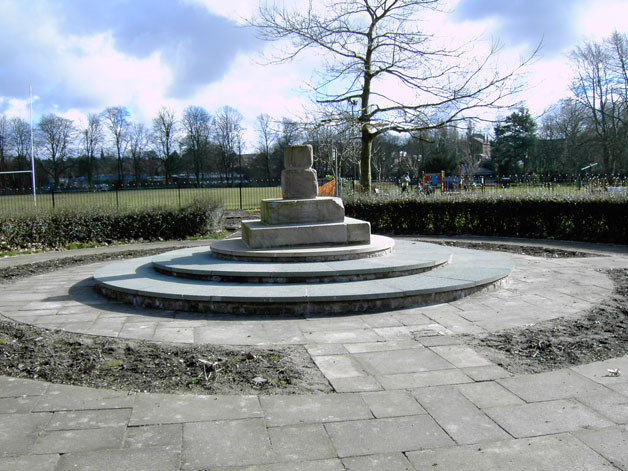 It was used as the first War Memorial in 1919, but once a permanent memorial had been established in 1923, the cross was moved to the North entrance of the park, standing at the end of the triangle of grass. In 1953 it was moved to a more central position.